Schocken Books has its origin as the Berlin publisher Schocken Verlag, established by Salman Schocken in 1931. 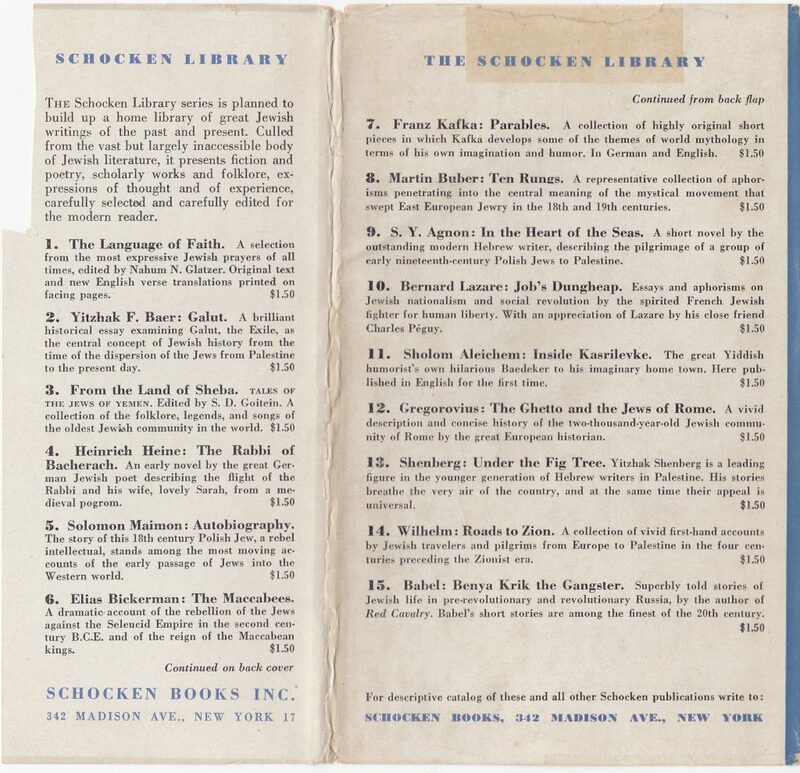 In 1934 Schocken emigrated to Mandate Palestine where the firm became the Hebrew-language Schocken Publishing House. 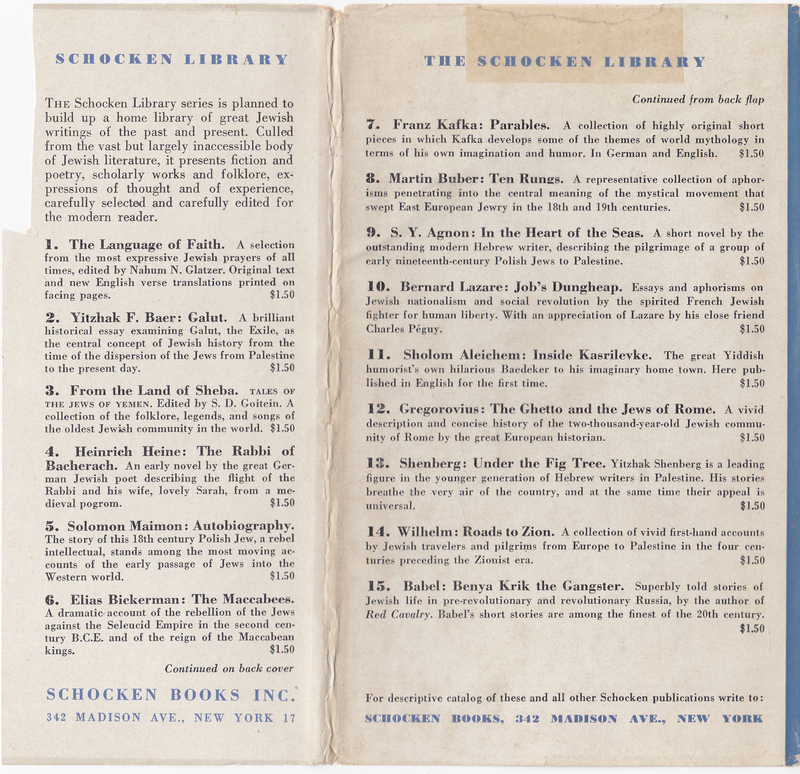 In 1940 Schocken emigrated to the U.S., and in 1945 Schocken Books was established in New York City. The publisher is currently an imprint of Random House, after being purchased in 1987. 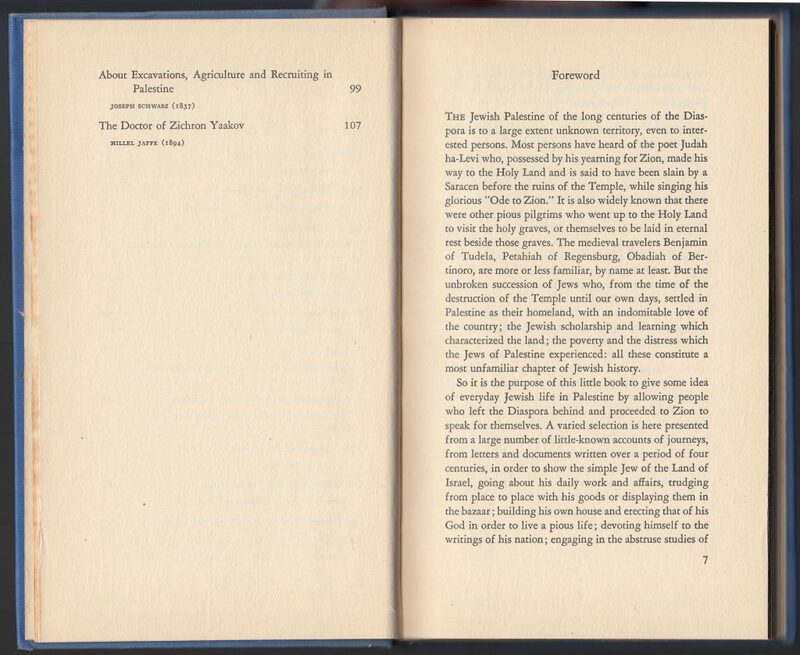 The Schocken Library was like many other mid-century publisher’s series, smaller in format, inexpensive, and consisting of classics – in this case, of Jewish writing (scholarly, prose, poetry, folklore, etc.). 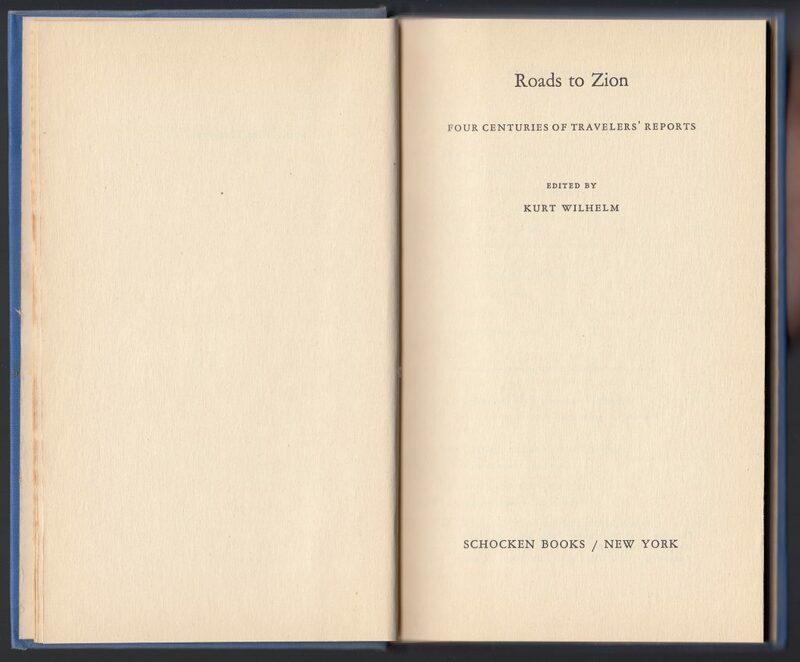 The first volumes were issued in 1947 at $1.50 and the last title reprinted in 1962. The jackets are unique to each title in the series. Printed on heavier paper, the series number (in this case #14) is included on the jacket spine. 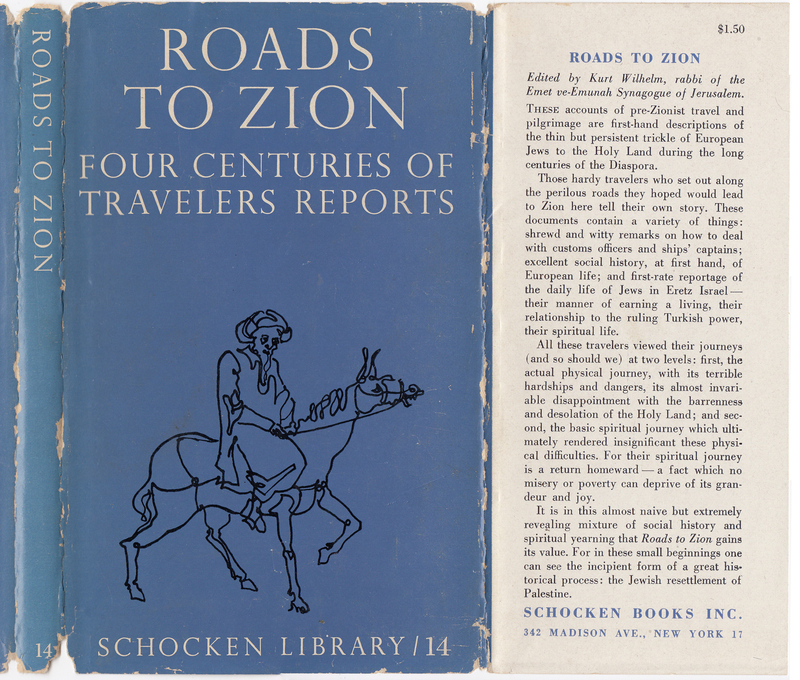 Roads to Zion: Four Centuries of Travellers Reports was edited by Kurt Wilhelm, and contains tales of travel by Jews to the Holy Land over many centuries. The title was first issued in 1948. The series name and the serial number are included on the bottom of the jacket front. The front jacket flap includes an overview of the book as well as the $1.50 price. The rear of the jacket and rear jacket flap list the initial 15 titles in the series. Each has a brief summary and all include a price (which is in each case $1.50). The series would top out at 20 titles, the last first published in 1949. The majority of titles were issued in 1947 (nine) and 1948 (eight) with three additional titles issued in 1949. A few reprints show up through 1962, but no new titles after 1949. #1. The Language of Faith: Selected Jewish Prayers, Nahum N. Glatzer, ed. #3. From the Land of Sheba, S.D. Goitiein, ed. #20: Yiddish Proverbs, Hanan J. Ayalti, ed. 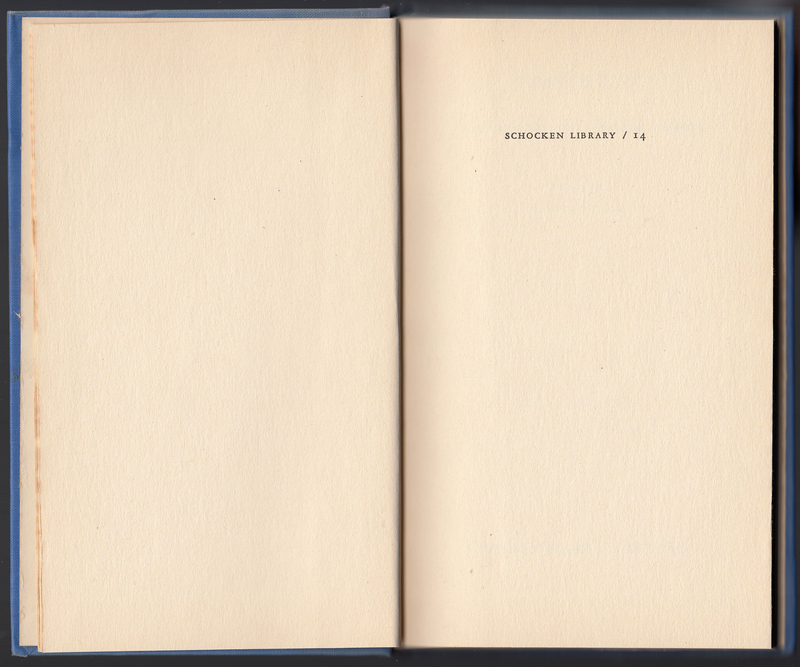 (WorldCat lists a copy of 1933: A Poem Sequence by Karl Wolfskehl, reprinted in 1947, in one instance as part of the Schocken Library series, but I believe this is a mistake). 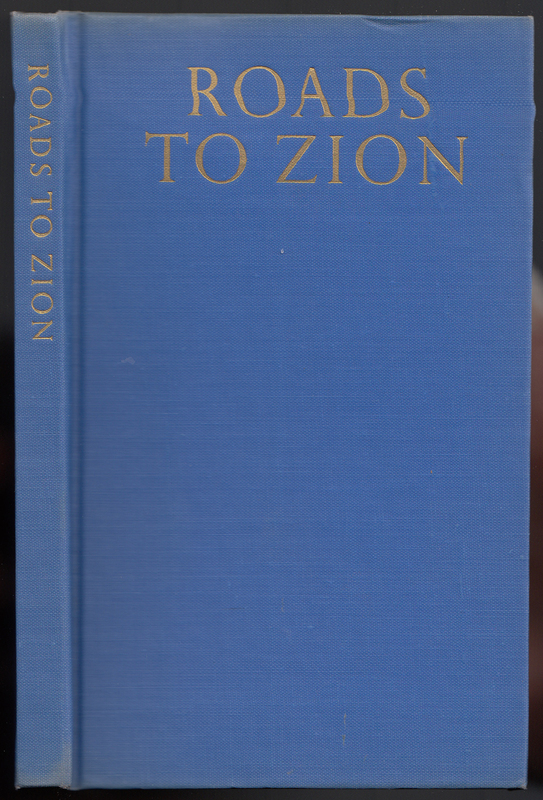 The bindings are cloth, blue in this case, with gold typography. The title is on the book, but no other information or decorations. The slight distortion in the scan below is because Festy the cat bumped my arm when I was scanning the book. 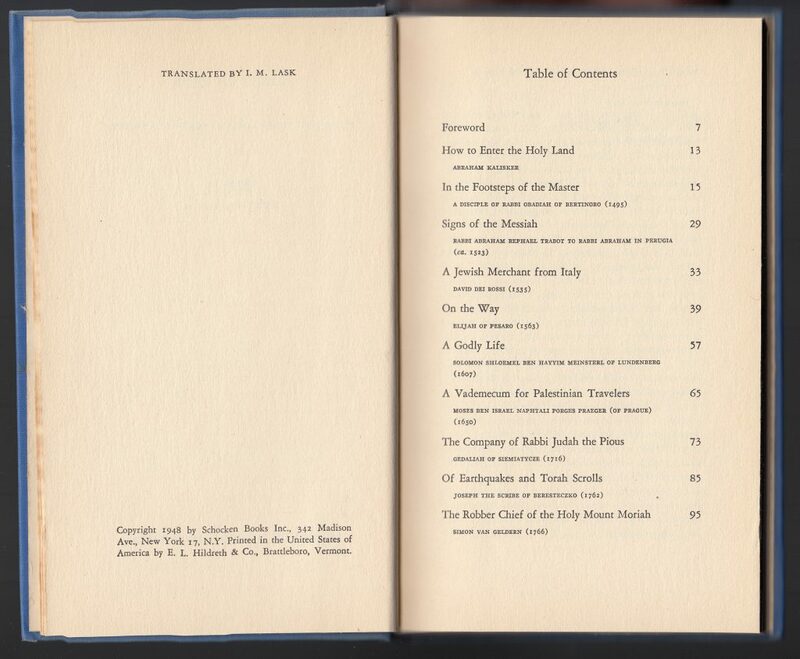 The half-title page includes the series name and the series number of the book, but not the title. The copyright page includes the translator (I.M. Lask) and the copyright date of 1948. The book was printed by E.L. Hildreth of Brattleboro, Vermont.